Lucy's Dressings was started in Lucy Mackenzie's busy, family kitchen just under 4 years ago in London. Working late into the night after she had put her children to bed, Lucy would put on her hairnet and bring up barrels of oil from the basement to make her dressings all through the night, bottling and labelling them by hand in order to send them off to her eager buyers. 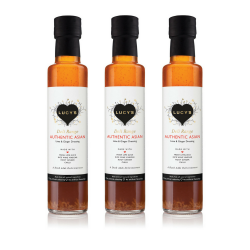 With a humble beginning of just 3 dressings, Lucy's range has now expanded and has caught the eye of cooks all around Britain. Lucy's Dressings aim to help make delicious and healthy meals with less hassle as she knows all too well how busy life can be. Winners of 6 Great Taste awards and counting. Food & Travel magazine said "...when you taste the range from Lucy’s Dressings you’ll quickly see why it has won several Great Taste Awards."